The inaugural edition of Accra Fashion Week is themed 'Celebrating African Fashion' and will take place for 5 days from the 5-9th of October at the Trade Fair Centre. The event will act as a hub for some of the most outstanding fashion designers across the African continent as well as those that intend to enter into the African fashion market. The event will primarily focus on business structures such as marketing, buyers, distribution, manufacturing and more. In the words of the the acting manager Pamela Odame "African fashion has grown and made tremendous changes around the world. We have seen in it the work of Viktor and Rolph, Valentino and more international brands adopting influences from Africa. If the international market is highly impressed by that then Accra Fashion Week is surely going to set new standards across fashion capitals around the world"
"We named this edition Celebrating African Fashion because there are very few entities that document the success African fashion has had around the world. The truth is African fashion is not the next big thing as some articles may have you believe, it is the biggest thing at the moment with various African themed fashion weeks across America, Europe and more. So this needs to be celebrated”. 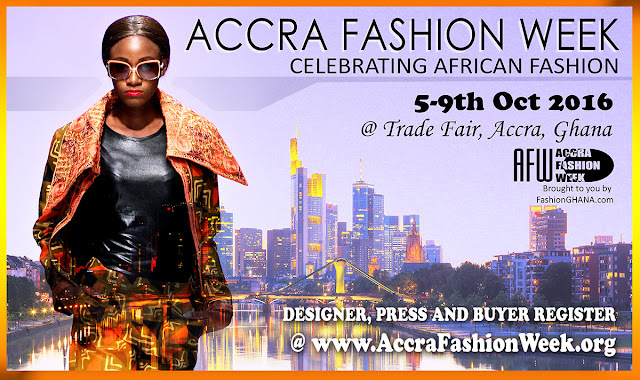 Designers have already been confirmed via the FashionGHANA.com network and the 5 day show is said to feature talent from 23 African countries as well as 9 foreign countries. Some are Cote d'Ivoire, Malawi, South Africa, Nigeria, Kenya, Uganda, UK, Brazil and France, with a few more to be confirmed. Accra Fashion Week extends invites to all countries hoping to make the event a true representation of African Fashion, culture and talent. "In all honestly, as much as we are set to celebrate African fashion, it is time to take it further. It is time to develop our fashion brands and build fashion structures including buyers, manufacturers, distributors and more. This is the main ethos behind Accra Fashion Week, turning talent into jobs and employment. It is something that we actually began working on since 2011 before FashionGHANA was launched, so expect to see much more".